Description: Cecil Williams Glide Community House will be having an opening celebration showcasing its new edible rooftop garden on Wednesday Nov. 3rd from 4:00-6:00. The main program begins at 5:00pm. The garden features various raised garden planters, a miniature greenhouse, a storage shed, a rainwater harvesting system, a worm composting system and a beautiful mural designed by residents. 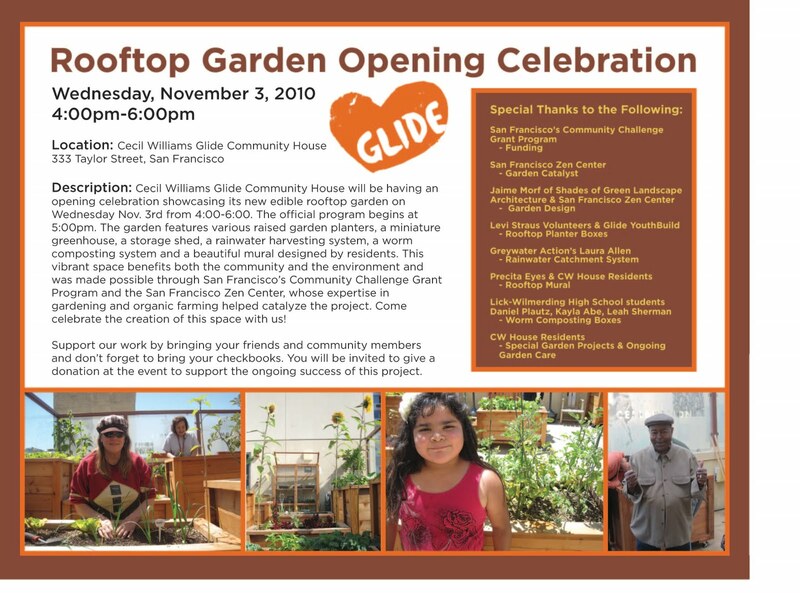 This vibrant space benefits both the community and the environment and was made possible through San Francisco’s Community Challenge Grant Program and the San Francisco Zen Center, whose expertise in gardening and organic farming helped catalyze the project. Come celebrate the creation of this space with us! Support our work by bringing your friends and community members and don’t forget to bring your checkbooks. You will be invited to give a donation at the event to support the ongoing success of this project.